A day after vandals spray-painted racist threats on the side of a Homer restaurant, community members have turned out to offer support. It’s unclear whether Alaska State Troopers are investigating this week’s attack targeting the interracial owners of Wasabi’s Bistro as a hate crime. It’s 5 p.m. where Wasabi’s lies on a major thoroughfare just outside of Homer city limits. The bright orange spray paint used to scrawl racist slurs and threats against the interracial couple that owns the restaurant has been painted over. The parking lot quickly fills up with cars full of patrons like Michael Lemay who have come to show their support. 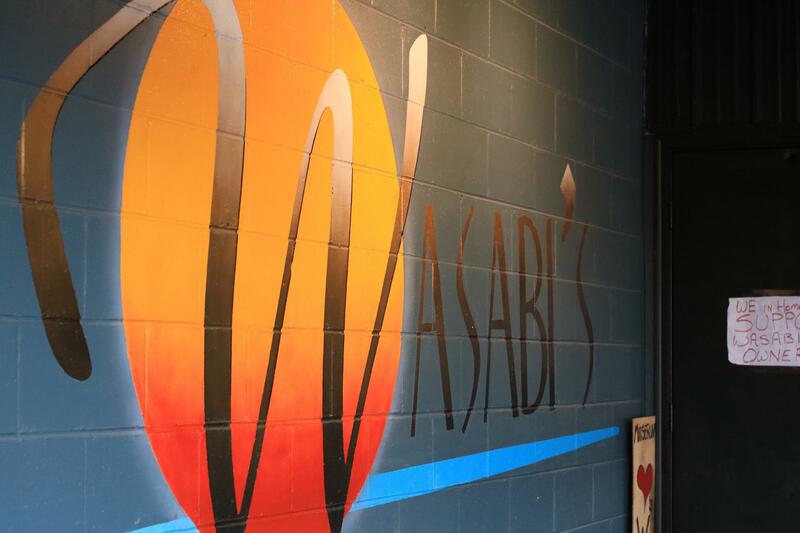 After pictures circulated on social media Thursday, it didn’t take long for community members and even competing restaurants to put out a call for Homer residents to patronize Wasabi’s as a gesture of support. Inside, it’s apparent that many heeded the call. Homer resident John Mahoney had eaten there just hours before the attack Wednesday. He returned again Thursday evening to offer support. However, others like Cindy and Alex Koplin are not. Like many in the restaurant, they blamed President Donald Trump’s divisive rhetoric for heating up an already tense political climate that’s emboldened racists. Wasabi’s husband and wife owners say they have been targeted several times. Co-owner Colt Belmonte, who is white, grew up in Homer. Hours after the vandalism, he pointed to bullet holes on the outside of the building. He said they’re about three years old, and as he began to paint over this week’s vandalism, he was clearly frustrated. “My wife and I are done. We don’t want to be here anymore,” Belmonte said. His wife of more than 20 years, Dali Frazier, is black. As she took a break from waiting tables Thursday evening, she explained that her car was vandalized with racial slurs in recent years, something she did report to police. Alaska State Trooper Sgt. Daniel Cox is asking the public for help identifying leads, and it’s unclear whether this week’s graffiti is being investigated as a hate crime. “It’s an active investigation. So, once the investigation is done, we may put more out, but at this point being active, we’re not putting too much out,” Cox told KBBI over the phone Thursday. Frazier hopes the extra attention will help catch whoever painted such a hateful message on her restaurant. However, she said after receiving hundreds of calls and text messages from well-wishers, her family is not going anywhere. With all the positive support, she expects a busy week ahead.